Christmas traditions were quite different while growing up in a northern Bavarian village in the 1960s. Marketing and consumerism have changed the spirit of Christmas since then. 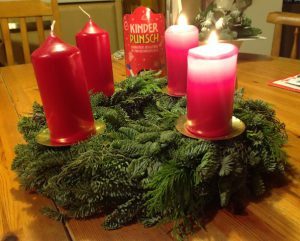 First of all, we never saw any Christmas decorations before Christmas, except for the traditional advent wreath (German: der Adventskranz). I grew up in a farming family of nine people (parents, grandmother, aunt, and five children). When we kids got in the way, we were told to go outside and play. This was especially the case in the late afternoon to early evening on Christmas Eve. I suppose we played out on the side walk, went sledding, or sneaked around the barn, looking for cats, mice, or trouble. On Christmas Eve, our day of gift-giving, we had an early and simple dinner – most often Sauerkraut and Bratwurst (fried sausage), or potato salad with Knoblauchwurst (pork sausage seasoned with garlic). Dinner had to be simple and quick, since the older family members had to set up Christmas behind the scenes – all afternoon and up to dinner time. We younger kids got restless sometimes, and tried to peak through the key hole into the living room. We did this in spite my mother’s warning that if we got caught peaking by the Christkind (Christchild, the angel gift-bringer), she would not bring any presents. The story we were told was this: The Christkind, an angel-like figure, dressed in white, with long curly blonde hair, would come in flying through the open window to deliver the presents. As a matter of fact, when we finally got called in, the room felt a bit chilly. The family must have been working on overdrive to get the tree decorated, the creche set up, the presents wrapped, and dinner made. They actually had to open the window for some cooling down. When we walked into the room, we little ones were awestruck by the shining Christmas ornaments on the tree, and real candles lighting up the tree. Typical presents at that time for me were (at least in our family): new pajamas, a doll, or a wind-up monkey. 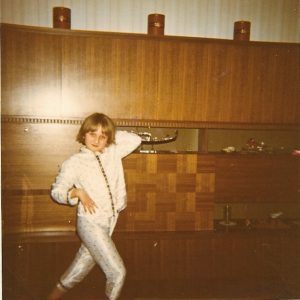 I remember being really proud of my shiny new pajamas. 🙂 Note the Venetian Gondola, a souvenir my oldest sister had brought back from her honeymoon to Rimini in 1968. 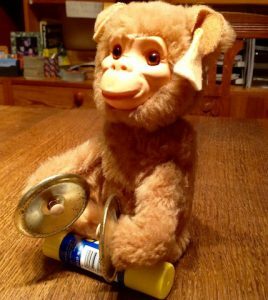 I got this kind of wind-up monkey for Christmas 1966. It did not last very long, unfortunately. The manufacturer is not to blame, just too many busy little hands. This one I found at a flea market in Kronberg in the late 1990s, and it still works. To keep him upright for his first photo opportunity in 50 years, I had to prop him up on a glue stick. Tired little monkey. In general back then, our Christmas tree sat there from 24 Dec – 6 January (Epiphany). Then it was time to bring this season to a close. There was no Christmas tree pick-up service at that time, and being farmers anyway, my father chopped up the tree, and we burned it in one of the two wood stoves we had in the house (kitchen and bathroom). Nowadays, in my own German-American family, we have fused both traditions, the German and the American one. By the time the second Christmas holiday (26 Dec) rolls around, I’ve had it with Christmas. We take the decorations off the Christmas tree before New Year’s Eve (American). The tree rests on the balcony until we throw it off the fourth floor balcony on pick-up day (after Epiphany), and either we, or the Hausmeister, drag it to the side of the road. 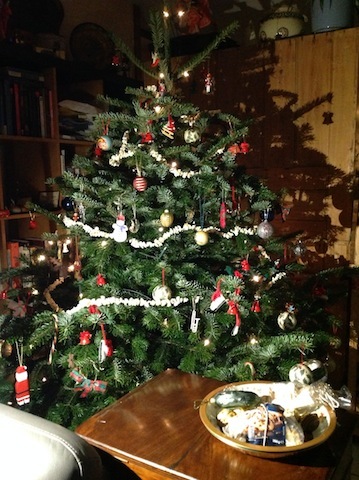 Our Christmas tree with some ornaments as old as our marriage certificate (close to 30 years). Before I forget – the Christkind brings the presents in central and southern Germany. Up in northern Germany, closer in location to the original Sinterklaas version (from the Netherlands) of Santa, there are families who tell stories of the Weihnachtsmann bringing the gifts. 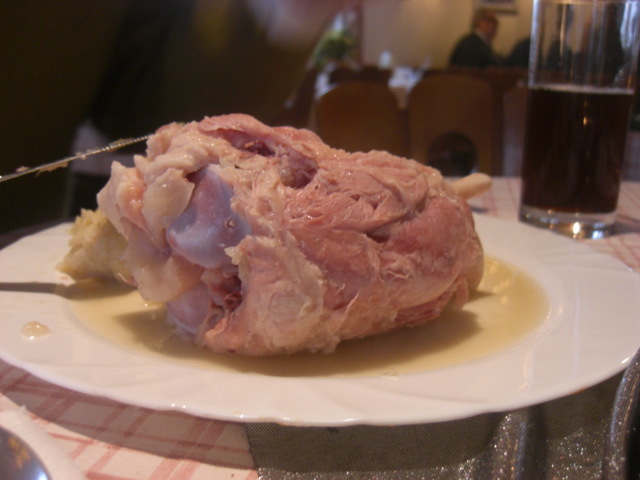 Traditionally, we eat pork (simmered pork knuckle, Bratwurst, or smoked pork chops) and Sauerkraut on New Year’s Day. Eating Sauerkraut is especially important, as it promises a financially good new year. 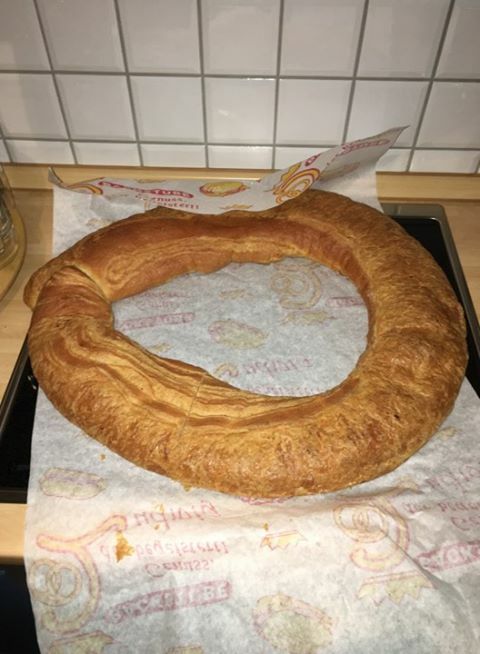 In some rural areas, you might also find the Eierring or Eierweck on the kitchen table. Many years ago, families had to pre-order the Eierring days in advance to make sure to get one. Fewer and fewer bakeries sell these nowadays, as demand has gone down for this traditional form of bread. The Eierring, with its round shape, is similar to the horse shoe, another good luck charm. Growing up, I remember having the Eierring on New Year’s Eve (while it is still fresh) and mulled wine. Whatever was left, we had on New Year’s Day as it was supposed to be. Same with the pork and Kraut – we had it for dinner this evening, and will have the remainder tomorrow, on New Year’s Day as it is meant to be. Have a great New Year’s Eve, wherever you are! 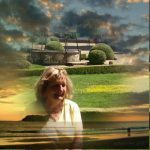 On GoOverseas I read the article 19 Ways to Reduce Homesickness When Living Abroad, which reminded me of my own battle with it at times while I lived in the U.S. and Japan for close to ten years. These 19 pointers are definitely worth reading, and yet, I’d also like to add a few of my own. Remember we had rough days in our home country too. But it is so easy to point the finger, e.g. 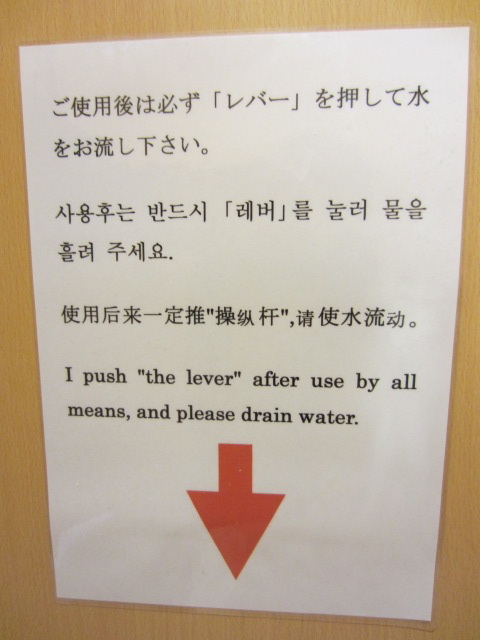 at a U.S. regulation flaw or the Japanese bureaucracy. There are things you probably disagreed with in your country of origin as well. Keep that in mind when confronted with challenges. While waiting for my U.S. work permit, I opted to use the university library to use my time wisely. I was able to help others less fortunate in language skills to navigate their way around. OK, this was unofficial volunteering, but I made some wonderful friends along the way. 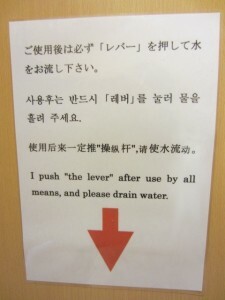 In Japan, e.g. I volunteered at a children’s home and made sure to limit my time to 6 weeks. That way, if paying work came up, I’d be free and without hard feelings for having to stop. In exchange for English conversation, I learned how to make some home-cooked Japanese food. We chose recipes with easy to get ingredients and I really enjoyed the process. I kept the empty packets, so I’d know what to pick up from the supermarket the next time around. It also gave me a sense of self-sufficiency. A full stomach with good food, good company, and a sense of accomplishment is at times more satisfying than a night out. This is your chance to share your writing and photos.You will be making more friends along the way. I have since I’ve kept this blog. And I’m not even in a foreign country, but after all these years of living abroad, even Germany can seem odd to me at times. There is no better time to take a look at yourself than when you are living abroad. You think you know yourself? Try again. Under normal circumstances, our reactions are predictable. But add language confusion and different cultural expectations, then you will get to see a new you. What used to annoy you before, you will suddenly find quaint. And vice versa. You do not have to reinvent yourself, your new environment will do this for you. Be prepared for some surprises. Living abroad can be a very fulfilling experience if you are willing to contribute. On our last night in Japan, our good friend Yoshiko took us out for okonomiyaki. My, oh my – this was good! Prior to going out, my companions wanted to know what it was and I described as a pancake with Japanese ingredients. I had had it before, but this time I tried it with mayo on the side. 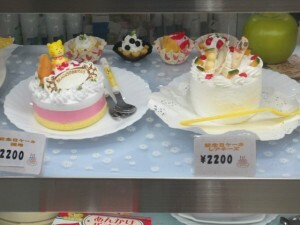 Surprisingly, I saw quite a few Japanese using mayo on dishes such as okonomiyaki, yakisoba, sushi, etc. 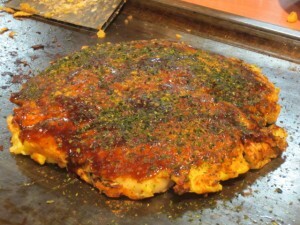 To learn more about its history and local varieties, visit History – Okonomiyaki World. What looks like very pleasant to our eyes and inviting to our taste buds is actually meant for canine pleasures. Found this pet shop with a wide selection of canine delicacies for all occasions. 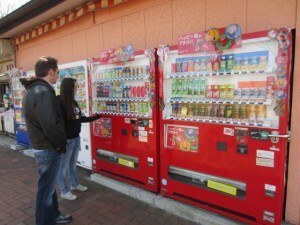 We surely miss all these jidou hanbaiki 自動販売機（じどうはんばいき） – Japan has the highest number of vending machines per capita around the world, averaging one machine for every 23 people. There are vending machines for hot and cold beverages, cigarettes, ice cubes, eggs, vegetables, umbrellas, beer, rice wine, instant noodles, and much more. It seems every street corner has at least one. There are close to 6 million machines throughout the country, generating a huge amount of sales. In 2008, a smart card called taspo was implemented in tobacco vending machines to restrict sales of cigarettes. From such machines, cigarette purchases may only be made by taspo card holders, which is issued to adult applicants (in Japan, this is 20 years of age). The card is held up to a sensor after money is inserted into the machine. Some beer vending machines also require age verification. At the Fukuoka Airport, I saw a tobacco vending machine customer holding up his wallet to the sensor. He did not even have to take out his card. This looked very futuristic to me. Japan spends a lot of money on its conveniences, but still neglects to hire proof-readers/translators when putting information onto print. 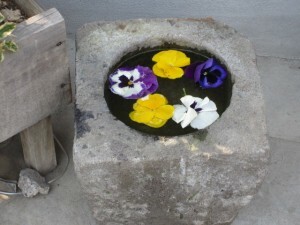 The simple beauty of a stone basin and floating flower heads, as seen in Japan, inspired me to take out my Imari bowl and snap off some pansy heads from the flower box on the balcony.